Boxing timers allow wrestlers, bodybuilding weightlifters, boxers, mixed-martial artists as well as general fitness enthusiasts to practice interval training (Source). Some of these boxing timers are analog like the Title Classic Interval Timer, some are wearable like the Title Personal Boxing Timer and the Everlast digital gym timers, and some are standalone digital gym timers. You can certainly find a smartphone app that mimics the look and functionality of a physical interval timer, but a lot of people prefer the real thing to use at the gym or in their home fitness areas. The Title Pro is our top pick- this digital countdown timer allows you to set round lengths from 30 seconds to 9 minutes. You can adjust the rest time from anywhere between 30 seconds to 5 minutes. It features a large and clear 2" digital display that's large enough to be seen in any moderate to large-sized gym. The bell volume can also be adjusted- it comes with low, medium and high settings so you can calibrate to your particular training area size. In general, reviewers were fairly pleased with this digital boxing gym timer, saying that it's a better option than purchasing an interval training app for your smartphone because it is large, visible, easy to program, durable and loud enough to be heard over noise from music and fans. Some people wish that it came with more sophisticated options, but other users say that that is exactly why they enjoy this particular boxing timer- all you have to do is program your interval training, or boxing rounds in, schedule the rest periods, and then you're good to go. Other users say that you can get pretty creative with the different lengths that you schedule if you are into practicing different conditioning drills. Another handy feature is that when you unplug it when it is not in use, because there is no on or off button, it will remember your previous settings. One amateur boxer who practices often in his home gym schedules it to three-minute intervals- this enables him to do sets of warm-up exercises that include rope jumping and a heavy bag routine. 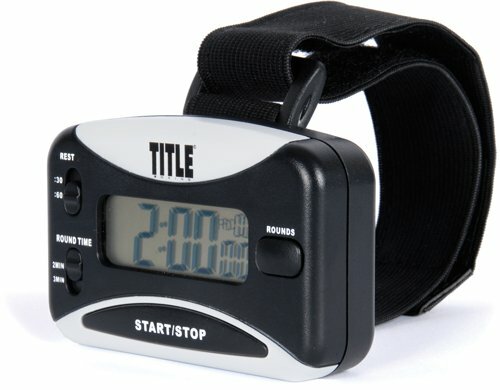 He was able to mount his Title digital gym timer on his wall so that it is always visible during his workout and the bell notifications are clearly audible even when he's playing loud music. This is definitely a solid option to consider if you are in the market for a standalone gym timer- but let's take a look at five of the other best-selling options on the market today. This personal boxing timer offered by Title is light, reliable and stylish. Users love the simple, but functional, design and that it’s perfect for interval workouts. However, some do note that the bell is too quiet and it would be hard to hear it over loud voices or music. With a size of 3″ x 2″ x 1.25″, this boxing ring timer can be set for a 2 or 3-minute round and 30-60 seconds rest between the rounds. It also has a bell sound and a vibration feature to alert you for the start and the end of each round. An elastic band is provided so you could wear it on the arm, or clip it to your shorts. Overall, it seems suitable both for novice and professional athletes. One user shares that the portability of this boxing round timer allows him to do his workouts wherever and whenever he wants. Another happy customer comments that he would recommend it to anyone interested in doing workouts since the interface is very simple – you just have to adjust the workout minutes, choose the number of rounds and the rest time and then press the start button. A martial teacher states that it works great for training environments since the bell can be heard clearly, but he wishes there are more time options for the rounds. But, some other customers have complained that the bell and the vibration feature are not loud enough for them and that it’s hard to operate the Title boxing timer with gloves on. 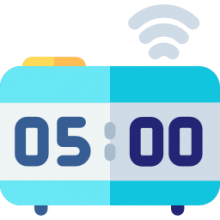 If you need a boxing ring timer for different activities and sports, you might want to take a look at this interval workout timer offered by Inventico. Users love the large display and that they can set their own workout time. However, some do note that it was difficult for them to program it. With a size of 3.3 x 1.3 x 3.3 inches and a weight of 4.8 ounces, this boxing gym timer can be used in wrestling, martial arts, fitness, weight lifting, and it allows you to set maximum 59 rounds with whatever workout and rest time you desire. As a whole, it seems compact and useful for tracking your gym time. Users have mixed opinions regarding this interval workout training timer. One user shares that he uses it several times a day, and he is extremely pleased, especially with the size of the digits. He states that it might be slightly difficult to set it up, but after that, you just have to press one button. Another purchaser comments that the beep sound is loud and adjustable, and it’s perfect for his bag workouts. However, even when he followed the instructions to the letter, he couldn’t set this workout boxing timer, so he had to figure it on his own. Other buyers have complained that it’s a lot smaller than they expected and that the display is thin and made from plastic. An unhappy user shares that the Inventico boxing ring timer stopped working after he dropped it on a carpeted floor and he wouldn’t recommend it to any active sportsman. If you are looking for a reliable and well-built gym boxing timer of higher than the average quality, the Title Boxing digital boxing gym timer is worth considering. Users love that the design, size and the loud alarm sound of this gym timer clock. However, some do note that it takes some time to get used to it. With a compact size of 12 x 4 x 12 inches and a weight of 3.7 pounds, this round workout timer is suitable both for the gym and your home. The round’s length can be set from 30 seconds to 9 minutes and the length of the rest – from 30 seconds to 5 minutes. This boxing timer has also a 2-inch digital display, an adjustable sound control and accompanying lights to show the mode and the remaining time. It seems handy for various workouts or exercises. 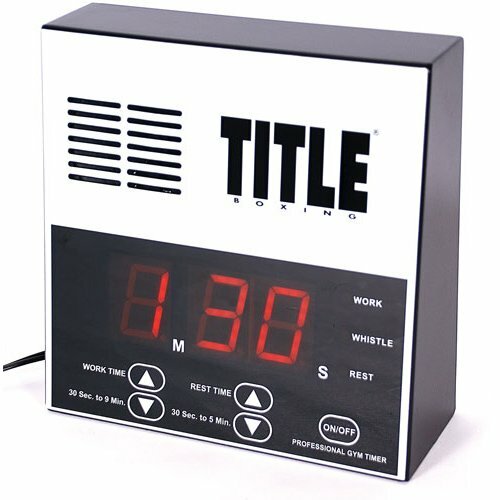 Generally, users are extremely satisfied with the performance of this Title boxing gym timer. One buyer shares it’s very durable, easy to program and loud enough to be heard over music or fan noise. The buyer is also happy that the timer remembers the previous settings when you unplug it, but he wishes that there isn’t any limit to the rest and workout intervals. Another pleased customer says that he mounted the boxing clock timer on the wall and the digits are visible, and he has used it for more than a year without any problems or malfunctioning. Moreover, another purchaser states that the boxing timer clock is made from high-quality materials, and even though he had knocked it down multiple times it stills works perfectly. The only thing that the customers complain about is that there isn’t on and off switch. 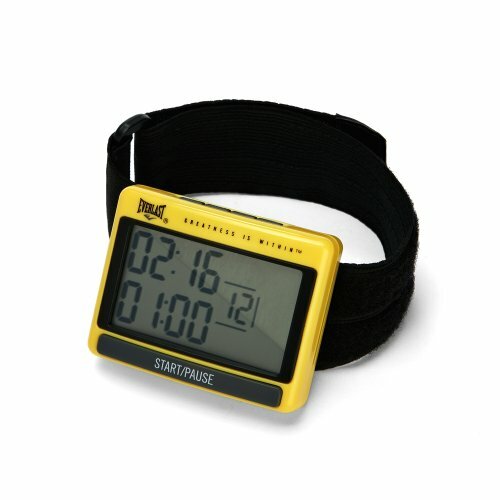 This Title classic personal interval timer is well-built, portable and useful for different types of exercises and sports. Users love that it’s simple to operate, loud and sturdily made. However, some do note that it’s too noisy for their liking. 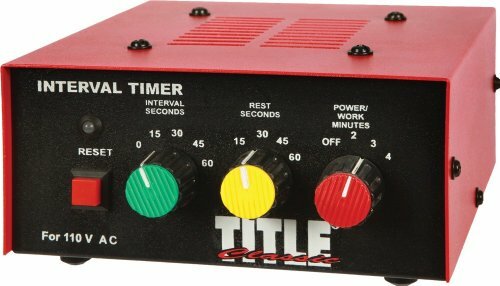 With a size of 8″ x 6″ x 3″, this Title interval boxing timer beeps multiple time to indicate the beginning or the end of the round and single beeps for interval period. The length of the rounds can be set from 2 to 4 minutes with interval periods during the rounds from 0 to 60 seconds. The rest’s length can be set between 15 and 60 seconds. Overall, it seems like a useful product, but a bit overpriced. Most users are happy with the personal boxing ring timer. One buyer shared that he bought it as a gift for his daughter and she was very impressed with the usefulness of the timer in her CrossFit training. Another customer comments that it’s a nice, loud and solid piece of equipment, but he isn’t happy with how the interval period works. He says that if you set the interval for 15 seconds for a 2 minute round, it would buzz 48 times, but it will not alert you that there are 15 seconds left in the round. While most of the purchasers are happy with the noise level, some complain that it’s too loud to be used comfortably around other people and they would have preferred if there was a way to adjust the volume. If you are looking for a well-built, functional, but reasonably priced timer, this Everlast interval workout round timer could be a good choice for you. Users love the bright yellow color, the big display screen and that it has a vibration feature. However, some do note that the bell ring tone is very irritating. With a size of 4.3 x 3.7 x 1.2 inches, this boxing interval timer weighs only 3.2 ounces and can be used both as an interval timer and a stopwatch. The rest period between the rounds can be adjusted, and it also comes with a detachable belt clip, an arm strap, and magnets. Overall, it seems effective and well-designed. Generally, users are divided in their opinions regarding the Everlast training boxing clock with most customers stating that it’s very difficult to set it up or change the settings afterward. One happy buyer comments that he likes that he can set it up to vibrate or ring when the period is nearly done, and he can focus on his activities rather than keep an eye on the timer. A satisfied user states that he uses it easily with his gloves on and the boxing ring timer works great. Another one happy purchaser shared that it was perfect for his running sessions, but it arrived with Russian instructions. Other customers also have complained about Russian instructions and some advise you to keep the English manual (if you get one) until you get the hang of it. Some have also commented that the belt clip is difficult to remove. As we have seen, there are a variety of different ways to keep track of your interval fitness training, no matter whether you are a boxer, a mixed-martial artist, or somebody that is extremely diligent about timing their training regimens. You can purchase a personal boxing timer that comes with an arm cuff, and features a sound as well as a vibration alert to let you know when rounds are beginning and ending. Perhaps you enjoy listening to headphones and wouldn't hear the alarm bells from a standalone interval trainer at the side of the ring or the edge of your fitness studio- and you need a vibration to let you know when to switch up your workout. That is when one of these wearable interval training timers might be a good fit for you. One amateur boxer says that he clipped his Title personal timer to his shorts, or sometimes places it on a shelf nearby his garage's punching bag- he says that he usually keeps it on an audible alarm setting because he finds that the vibration feature isn't strong enough to notify him when he's working out really intensely. Another user says that as a martial arts instructor, he uses it to coordinate his group karate training classes- setting two or three minute rounds with 32 second or 60 second interval breaks. This reviewer says that the alarm is loud and clear, even in a martial arts training environment I can get pretty loud. The Everlast interval training timer has a lot of advantages besides just it's inexpensive price. One reviewer that we interacted with says that he likes it because of its simple and intuitive interface. There are large Start and Pause buttons that make it easy and clear to use even when you are hyperventilating from a tough workout. He also appreciated the quality instructions that were included- if you've ever purchased electronic devices before over the Internet, sometimes you will be shipped indecipherable instructions that were run through a Google translate algorithm. One feature that he particularly liked is that the AAA batteries are not stored in one single compartment but are actually split between different sides of the devices, this makes the unit more balanced- something that you can appreciate when you are conducting high-impact exercises that require balance and coordination. The standalone gym timers are definitely a different style of interval training timer but they have advantages over the wearable options, for sure. They are particularly useful if you want to have a large digital display and in the case of the Title Boxing Pro interval timer, something that is visible from a good distance away. One CrossFit enthusiast says that he doesn't like the wearable timers because they are too bulky to wear during his high-impact, aerobic exercises so he opted to buy a timer that has a large digital clock display that keeps him on track. Another reviewer that practices resistance training uses it to schedule and calibrate rest time between his sets- you can figure out a way to program your specific training requirements into it and the interval workout timer will keep you on pace with your fitness goals. If you are in the market for one of these boxing and interval training timers, make sure you figure out whether a wearable unit or one that is standalone is the right option for you. These units have become more popular as the interval training craze has taken off. This is because research has demonstrated that interval training workouts, in which high intensity and low-intensity intervals are alternated, provide greater caloric burn than steady states of cardiovascular exercise. It's important to plan your interval training workouts out in advance- and if you are new, be aware that it is tough and will likely take a couple of weeks before you are fully acclimated to doing it.